An 82nd minute goal by McCall Zerboni helped the Courage earn a draw and remain unbeaten this season. SCORE: 0-1, min. 37, Kerr. 1-1, min. 82, Zerboni. REFEREE: Mewis (min. 45), Nagasato (min. 45 + 3), Zerboni (min. 71), Vasconcelos (min. 73). 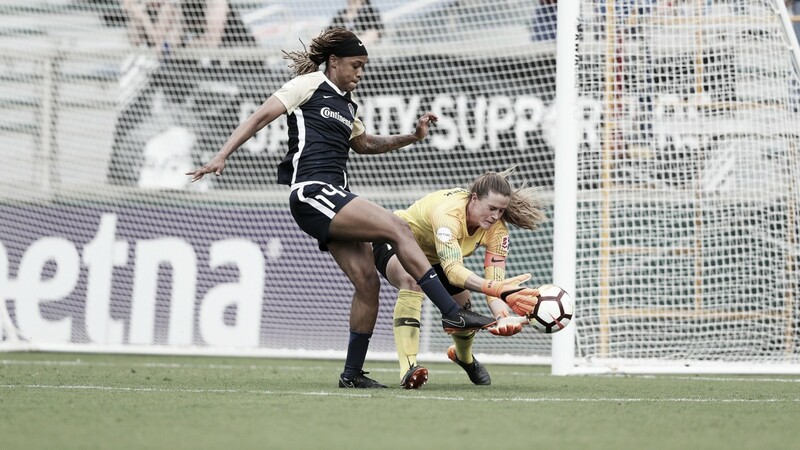 Goalkeeping and missed chances summed up the battle between the North Carolina Courage as they hosted the Chicago Red Stars to a 1-1 draw. Sam Kerr scored her first goal with the Red Stars in the first half of the match. The Courage equalized late off of a McCall Zerboni goal in the second half. With the point, North Carolina is now seven points ahead of Seattle Reign FC for first place in the league. The Courage (5-0-2) have 17 points and are looking for their second-straight shield for the most points in the regular season. Chicago isn’t far behind with 10 points, tied with Seattle and two clear of Portland Thorns FC who are in fourth. The Red Stars are 2-2-4 with a three-game unbeaten streak. While the score will show 1-1, North Carolina dominated offensively. They outshot Chicago 42-8 with 15 shots on goal to the Red Stars’ two. 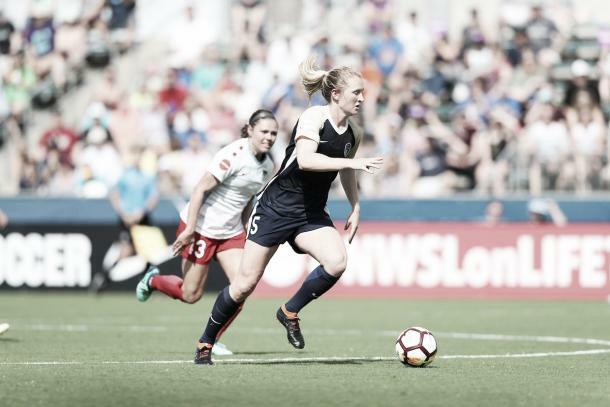 Crystal Dunn and Samantha Mewis, in her first start of the season, both had seven shots, Zerboni had six and Debinha and Lynn Williams had five each. Chicago goalkeeper Alyssa Naeher’s efforts kept the Courage with the lone goal. Naeher had 12 saves for the Red Stars as opposed to Sabrina D’Angelo’s one saves. The Courage also led the match possession wise, 58% to Chicago’s 42%. Both teams were even in yellow cards for the match with two each. The first card came in the 45th minute after Mewis made a hard tackle on Red Stars midfielder Nikki Stanton. Chicago forward Yuki Nagasato earned her yellow three minutes into first-half stoppage time. The second half saw both Zerboni and Red Stars forward Michelle Vasconcelos being booked for fouls. Chicago opened up scoring in the 37th minute, marking Kerr’s first goal since joining the Red Stars this season. Defender Alyssa Mautz sent a driven ball to Kerr who dribbled toward the end line and took the tough angle to get the ball past D’Angelo and to the back of the net. This was the second time all season that the Courage were trailing, but it wouldn’t last. Late in the second half, defender Jaelene Hinkle took one of North Carolina’s 12 corner kicks and sent it to Abby Erceg who flicked the ball to Zerboni who put it in the net. The volley goal in the 82nd minute leveled the game and would be good enough to help each team earn a point. Both teams will return to action Saturday May 12. North Carolina hosts the Washington Spirit at 7:00 p.m. ET on go90 and Chicago will face off with Houston Dash for the third time this season at Toyota Park in Bridgeview, IL. Kick off for that game is 7:00 p.m. CT also on go90.